Just because the TD Ottawa Jazz Festival has concluded doesn’t mean that potent live jazz won’t allowed within the city limits for the rest of the week. In fact, Toronto saxophonist and flutist Jane Bunnett will play four concerts later this week (two per night on Thursday and Friday) at GigSpace. 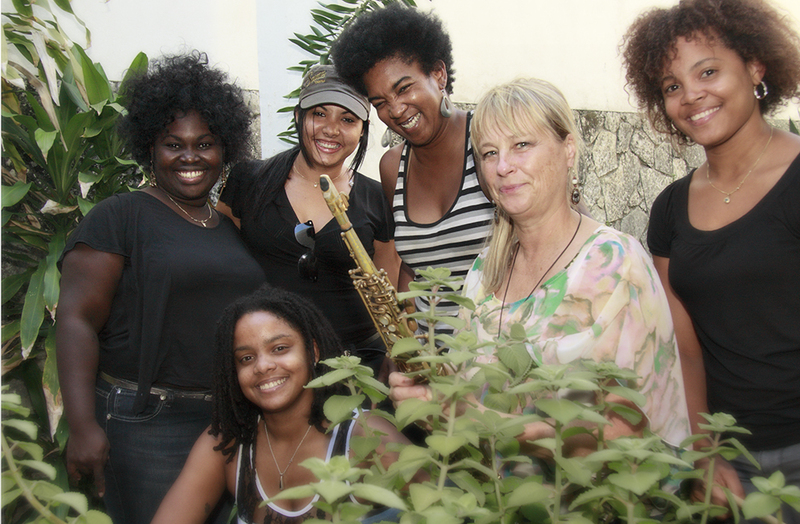 Fresh from a two-run of Canadian jazz festivals west of Ottawa, Bunnett is bringing to the intimate, 46-seat Gladstone Avenue performance space a new all-female and all-Cuban group called Maqueque. Here’s the lowdown on the band and its music from Bunnett, who along with her husband, Larry Cramer, has been a fierce advocate of Cuban music and culture for more than three decades. 1. Please tell me how you met the musicians in Maqueque. Percussionist and vocalist Daymé Arceno was the first artist we met at a jazz fest in Cuba, while she was there playing with a group of her own. We invited her to come and play/jam at the hotel we were staying at during JAZZ FM 91’s host Jaymz Bee’s Safari trip, and we saw such a spark in her that we took her under our wing. We invited her to come to Toronto the following year for one of our “Sistering” shows, (she was maybe 18 at the time, but totally fearless), and the audiences were blown away by her! She really commanded their attention. From there, Daymé went out and video-taped a number of pianists and then we auditioned them. We also knew Yissy Garcia and from there began to keep our eyes and ears open for other players who could work well together musically and personality-wise. 2. Do any of them have especially striking stories when it comes to their lives or the role of music in their lives? If so, can you share them? There are many of course, but Daymé’s story in particular, struck a chord with me and brought me to tears. She told me that when she was very young, she was in a school choir and they used to perform in Catholic churches. She was never allowed to go and had to stay in the classroom alone, because the teacher (choir leader) didn’t think she fit the aesthetic. She thought Daymé was too black, too fat and too short. Not only that, but she saw her as too old looking as well. At one point the choir was in need of a song for Mother’s Day so the then 13 year old fearless and determined girl wrote one in about 20 minutes for the choir to perform. She was apparently allowed to sing with the choir this time and the performance of the that song apparently brought everyone to tears. She had saved the day. They had performed for the first time, with Daymé in front of a superior of the choir leader, who then asked why she had not seen Daymé before. The choir leader was reprimanded and so Daymé eventually sang with the choir before the great Hugo Chavez with whom she had her photo taken as he hugged her. The photo hit the front page of the newspaper and she has never looked back. Daymé is a very strong and persevering young woman who will go very far in her career. 3. Why did you assemble an all-female band? For about 30 years now, we’ve had many great musicians come through our Spirits of Havana project and through the Cuban conservatories etc., for example, Dafnis Prieto, Yosvanny Terry, Pedrito Martínez and David Virelles. It suddenly dawned on us (well, it was mostly Larry’s idea), that there are so many incredibly talented female artists in Cuba, yet we’d never see them at the festivals or the jams. The music scene there is heavily male-dominated, (they’re very macho in the music community in Cuba), and so often, after some 15 years of musical training, these young women would just end up hooking up with a talented male musician. Their own careers would go by the wayside, concentrating only on the man’s career. It’s very hard for them in Latin American countries. We felt it was really important to do, because we hadn’t yet extended the possibility to any of these women and we really wanted to help some of them move their careers along, give them a leg up. 4. What does it mean for you to make music with them outside of Cuba? What does it mean for them? From my point of view, I feel like I’m sending a distinct message to Latin America, the Americas, the whole world in fact, by blending these forms of music, world and jazz etc. Often you’ll see a female vocalist headliner and the band will be all-male. This group of young women are all individually extremely proficient and creative musicians and I hope that it will inspire other women to put themselves out there more, especially in Latin America. For them, I think that by guiding and mentoring, it helps them to see how it can be, living the life of a musician, playing every day. They’ll have exposure to so many new audiences and it’s not the kind of experience they can easily get in Cuba, where they need constant permission to play in clubs and simple necessities like electricity and proper working instruments are not always accessible. Things we take for granted every day are not easily had in Cuba. Once we even had to rehearse in complete darkness! 5.Tell me a bit about the material the group performs. More than half of the tunes are my originals, some are written by Daymé. There is also an Afro-Cuban cover of Ain’t No Sunshine When She’s Gone and an exciting cover of a popular 1940’s Cuban piece called Mamey Colorao, which is rarely done anymore. This project emphasizes vocal harmonies much more than previous works and the live performances are highly energetic and spontaneous. 6. What do you hope the future will bring for this project? We hope to continue this project for awhile, travelling and conquering more ground. The plan is to tour widely around the globe while inviting special female guests from each city to perform with us. The idea is to present headlining artists but emerging artists as well, so we can help nurture their careers along the way too. Something similar to Sarah McLachlan’s Lilith Fair. Jane Bunnett and Maqueque play Thursday, July 3, and Friday, July 4, at GigSpace (953 Gladstone Ave.) with shows at 7 and 9 each night. Admission is $25 per show. Call 613-729-0693 to reserve. The group also has concerts later in July in Ontario, as listed here.